V. Rev. Eric Andrews, CSP is the President of the Paulist Fathers. 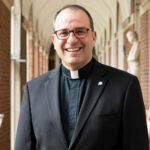 He began a career in media with the Muppets after graduating from NYU, and has served as pastor of St. John XXIII campus ministry at the University of Tenn., and president of Paulist Productions in California before his election to lead the Paulists in 2014.